When it comes to keeping the body working at its prime, the thyroid organ holds a crucial role. To optimize the function of your thyroid, incorporating certain foods in your diet - and excluding others - is a must. WebMD describes the thyroid as a butterfly-shaped gland located in the base of the neck. The thyroid is responsible for secreting two vital hormones, triiodothyronine, referred to as T3, and thyroxine, referred to as T4. The proper balance of T3 and T4 is essential for energy production at the cellular level, including transport of oxygen into cells where energy is made. Due to this immense responsibility, the thyroid gland acts as a control key for nearly every chemical reaction that occurs in the body, reports the U.S. National Library of Medicine. For example, when T3 enters cells and revs up metabolic activity within the cell, a variety of other hormones, neurotransmitters, and enzymes are set into action as well. WebMD notes that the dysfunction of the thyroid gland may lead to the development of a goiter, the presence of nodules, cancer, and a temporary condition called postpartum thyroiditis. Similarly, hyperthyroidism and hypothyroidism (or an overactive or underactive thyroid, respectively) may occur as a result of thyroid dysfunction. Health notes that individuals who experience unexpected weight gain and have difficulty losing weight despite calorie reduction and increased expenditure through physical activity may be suffering from thyroid disease. Since the condition may lead to a sluggish metabolism, a reduction in overall calories may be beneficial for individuals struggling with weight loss. While no diet works for everyone, the same is true with a thyroid-supportive diet. In general, the better the quality of food ingested, the healthier the thyroid gland will be, as well as every other human gland, organ and cell within the body. According to the American Thyroid Association, iodine is a necessary component of T3 and T4. It combines with the amino acid tyrosine and gets converted into the two thyroid hormones. For this reason, getting sufficient amounts of iodine through fish, seaweed, iodized salt, and shellfish is critical for the optimal function of the thyroid. In her book, The Thyroid Diet: Manage Your Metabolism for Lasting Weight Loss, Mary Shomon thoroughly describes the mechanism of insulin resistance associated with thyroid diseases. 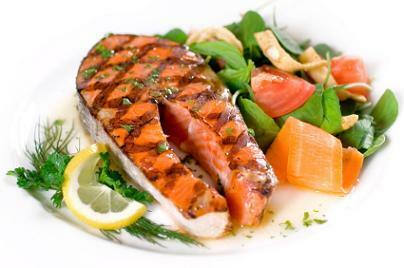 Due to this strong association, a low carbohydrate, high protein diet is outlined. This includes adequate food combining at each meal and snack to incorporate protein, fat, fiber, and carbohydrates accordingly. In this way, glucose enters the bloodstream gradually, which in turn modulates the amount of insulin release. A controlled insulin production means a more efficient use of calories and less opportunity for the body to store calories. This all equates to lessening the chances of further weight gain and encouraging an environment conducive for weight loss. 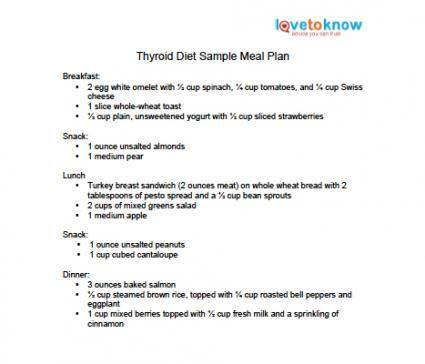 Download a sample thyroid diet meal plan. Limiting the following high glycemic foods, or at least not eating them alone, will help with a successful thyroid diet. Since it takes more energy to break down protein than carbohydrates and fat, it is easy to see that metabolic rate would also increase in relation to protein intake. It should come as no surprise, then, that in the book Nutrition Therapy and Pathophysiology, Marcia Nelms, Kathryn Sucher, and Sara Long tout the importance of a diet that includes good sources of lean protein, such as fish, white meat poultry, legumes, egg whites, and lean cuts of beef. An adequate intake of protein will also deter hair loss that often accompanies an under-active thyroid condition. Healthy adults are generally encouraged to consume between 25 and 38 grams of fiber per day, suggests WebMD. Since fiber slows down the rate at which food (including simple carbohydrates) are digested, getting this quota is important when it comes to keeping insulin levels in check. In general, a multi-vitamin is beneficial in a thyroid diet. Zinc has been shown to be a required mineral for the prevention of diminishing T3 levels, especially when caloric reduction takes place for weight loss purposes. Selenium behaves in a similar fashion. Nelms, Sucher and Long suggest a daily dose of 15 to 25 milligrams of zinc and 400 micrograms of selenium to combat thyroid dysfunction. A thyroid diet is an important part of the treatment plan for those who suffer from thyroid dysfunction. Be sure to talk with your primary doctor or a registered dietitian for more information when it comes to incorporating this type of eating style into your life.